Limited time special - 10% off! Irish saint medal is crafted in sterling silver and features St. Brigid. 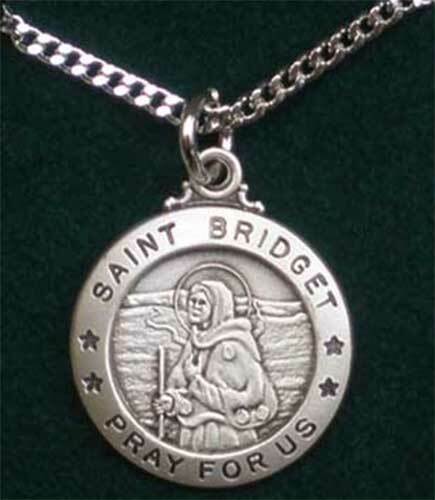 St. Bridget Pray For Us is embossed on this Irish saint medal. This sterling silver Irish saint medal features a detailed embossed depiction of St. Bridget (Brigid of Kildare). The dimensional pendant measures 3/4" diameter. This patron saint of Ireland medal includes a heavy 20" long rhodium plated chain and it is made in the United States. The St. Brigid necklace, from The Irish Gift House, is received gift boxed. Irish saint medal is a double sided necklace that is crafted in sterling silver and features both St. Patrick and St. Bridget. Irish necklace features Saint Florian, the patron saint of firefighters. Irish necklace features Saint Michael, the patron saint of police officers. Irish saint medal is crafted in sterling silver and features St. Brendan. Irish necklace features Saint Christopher, the patron saint of travelers. Irish saint medal is crafted in sterling silver and features St. Patrick.